Big cities in the U.S. tend toward the liberal side of the political spectrum, even when they’re within conservative states (residents of Austin sometimes joke that their city is “an island surrounded by Texas”). 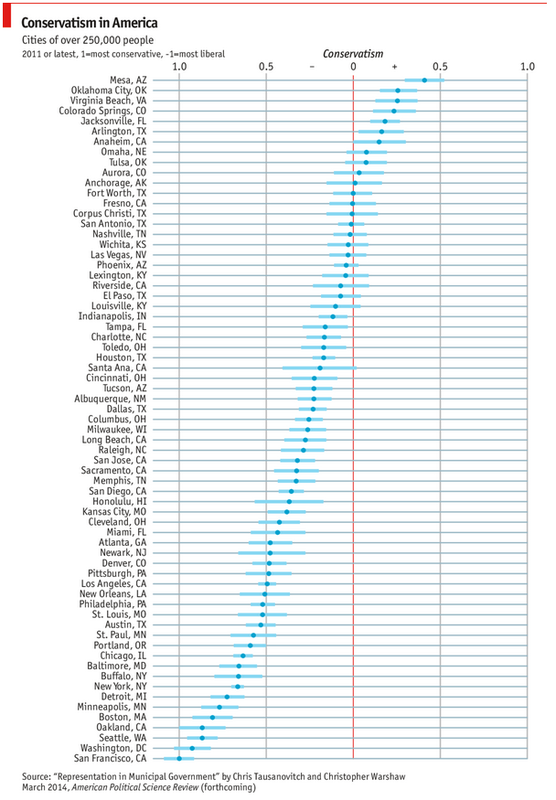 But which cities are more liberal — or conservative — than their reputations? Overall, the liberal tilt of big cities is unmistakable. Even cities with conservative reputations (such as Dallas, Santa Ana, Calif. and Cincinnati) show up as left-of-center, if only slightly. This is perhaps not surprising: As the Pew Research Center recently found, 46% of consistent liberals said they’d prefer to live in a city, versus just 4% of consistent conservatives. Liberals also are about twice as likely as conservatives to live in urban areas, while conservatives are more concentrated in rural areas.